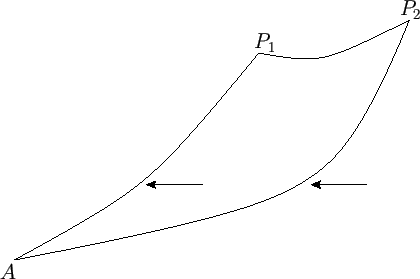 The function is known as the stream function. Moreover, the existence of a stream function is a direct consequence of the assumed incompressible nature of the flow. Consider two points, and , in addition to the fixed point . (See Figure 5.2.) Let and be the fluxes from right to left across curves and . Using similar arguments to those employed previously, the flux across is equal to the flux across plus the flux across . Thus, the flux across , from right to left, is . If and both lie on the same streamline then the flux across is zero, because the local fluid velocity is directed everywhere parallel to . It follows that . Hence, we conclude that the stream function is constant along a streamline. 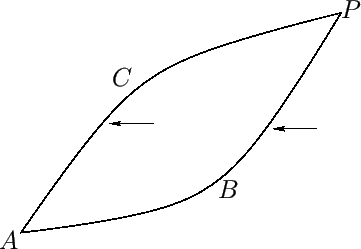 The equation of a streamline is thus , where is an arbitrary constant. Note that when the fluid velocity is written in this form then it immediately becomes clear that the incompressibility constraint is automatically satisfied [because --see Equations (A.175) and (A.176)]. It is also clear that the stream function is undefined to an arbitrary additive constant.